One of New York’s most celebrated restaurants — and its most prestigious Italian restaurant — is getting a new chef. Mark Ladner, who has run the kitchen at Del Posto since it opened in 2005, will leave next month to focus full-time on an idea he wants to turn into a pasta chain. Under Ladner, Del Posto, part of Mario Batali’s restaurant empire, has received basically every accolade a restaurant can, and he’s considered to be among the best pasta chefs in the country. He is also responsible for the famed 100-layer lasagna that became something of a fetish object for carb lovers far and wide. Now he tells the Times he’s leaving to focus on Pasta Flyer, a quick-service restaurant currently being built in Greenwich Village and which Ladner wants to turn into a chain. His departure also follows that of Brooks Headley, the former pastry chef who went on to open Superiority Burger. It’s rare to see chef changes at the very highest end of the restaurant food chain, if only because the head chefs are often equity partners in their restaurants. 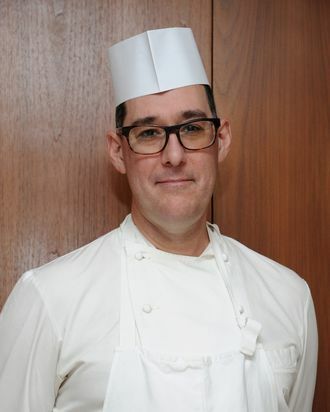 Ladner tells the Times that wasn’t the case at Del Posto, and he hopes the new concept will scratch his ownership itch. Meanwhile at Del Posto, the new executive chef will be Melissa Rodriguez, who had served as Ladner’s chef de cuisine. Batali tells the paper that Rodriguez’s menu will roll out in February.